Nothing goes with a golden summertime tan like a brilliantly white smile. Whether you’ve got a graduation or wedding you’d like to look your best for, or you just want to look and feel great this summer, teeth whitening is a simple, comfortable way to transform your smile. At Dental Expressions, we offer in-office and take-home teeth whitening solutions that outshine those over the counter varieties available in local stores. Call our team to find out more or schedule a consultation for teeth whitening at our Oklahoma City, OK dental office. In-office teeth whitening is the go-to solution for those who are looking to dramatically transform their smile in just one appointment. Completely under the observation of one of our skilled dentists, we’ll apply professional strength whitening agents, and within about an hour, you’ll see a smile as much as ten shades brighter. For patients who experience tooth sensitivity following in-office teeth whitening, we can also provide fluoride treatments. Patients who are prone to dental sensitivity and those who want to brighten their smiles more gradually may prefer a take-home whitening kit. We use the same customized, professional level doses of active whitening agent and combine them with a custom crafted whitening tray to deliver dramatically brighter results possible with in-office whitening. Patients will simply need to wear these trays for a short time each day. While most see significant improvement right away, they typically achieve their desired end result after about two weeks of daily application. If you’re ready to kick start your summer with a brighter smile from the Dental Expressions team, call our office to schedule an appointment. 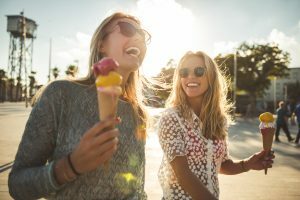 We’ll examine your teeth, review your whitening options, and help you find the perfect teeth whitening solution to deliver dazzling smiles all summer long. For those looking for a cosmetic treatment option that packs a bigger punch, we offer porcelain veneers, dental bonding, and more to help patients achieve their best and brightest smiles.